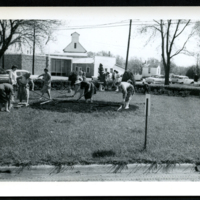 Photo of women doing garden work in front of the post office, possibly circa 1950.
unknown, “Women gardening,” Hesston Public Library, accessed April 25, 2019, https://hesston.digitalsckls.info/item/1740. 4.5 in. x 3.5 in.